Tyson and I have been married ONE YEAR today, and we're doing very well. I'm very happy to be married to such a great man. For our anniversary we went to Salt lake for the jazz game, and of course, I FORGOT MY CAMERA! :( bummer. Anyhow, it turned out great. We stayed at a nice hotel, and we both enjoyed every minute of our time with one another. 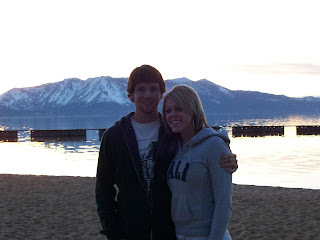 I was looking back at photo's from our honeymoon in Nevada and Lake Tahoe, and they kinda made me laugh.. we've both changed so much. So, i thought i'd share a few of our crazy photo's from then. Lake Tahoe is behind us. We both thought it was Super Pretty there when the sun was setting! So, YES, we are very happy and very in LOVE! Hey this is Megan. I'm Ramsey Cox's sister. Anyway, I had a question for you. My sister told me that your brother got into some appt for cheap. I was wondering if you got into them also. We might be moving down to St.George in August and need to find a place. So I was wondering if you could tell me a little about them. Where they are and if you have to get on a list or something like that. I would appreciate it alot. Thanks! You can write me back on my blog.